OK, here we go. 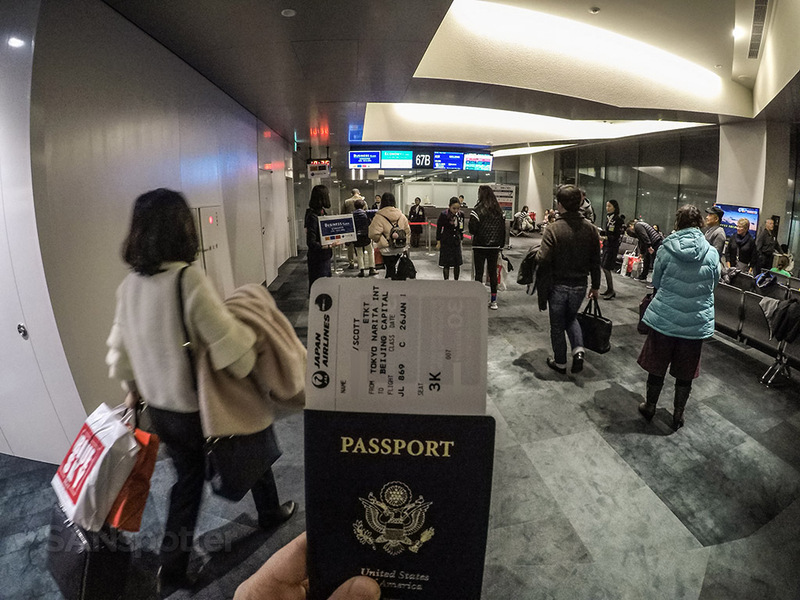 It’s time to switch modes from “happy and relaxed traveler” to “overstressed tourist teetering on the edge of a panic attack”, and it had the potential to get messy. 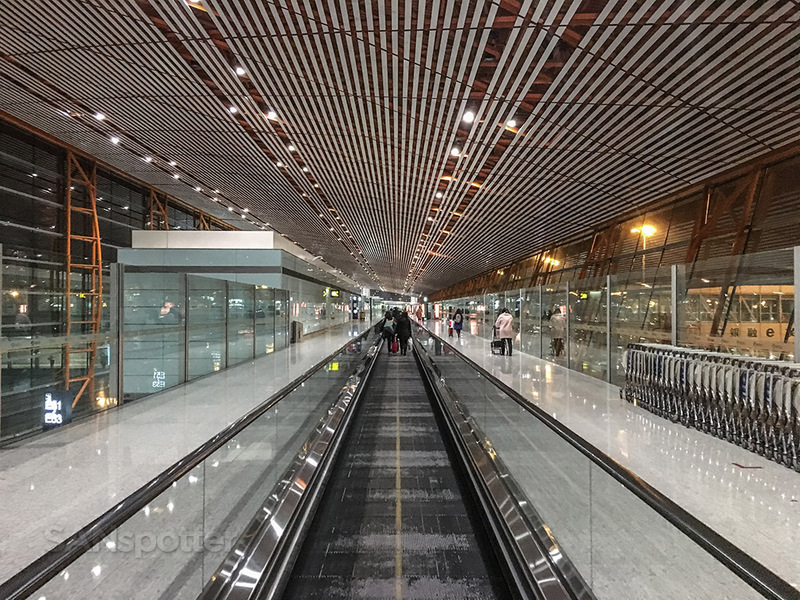 I really hate feeling stressed when I travel, but unfortunately I had exactly an hour and 15 minutes to make my connection to Beijing after arriving from San Diego, and I really didn’t know if I was going to make it. 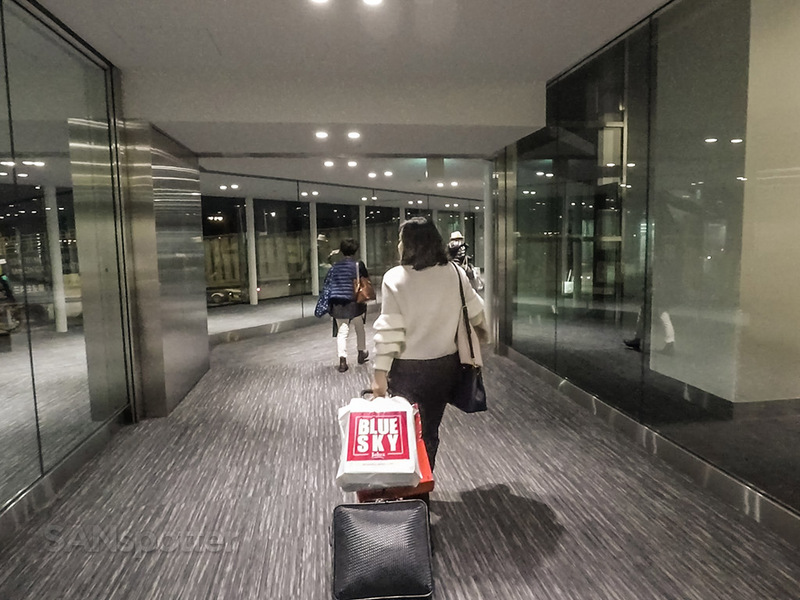 I have transited at NRT many times over the years, and past experience has taught me that it’s really a crapshoot in terms of the time it takes to get through the security check and back out into the main terminal. I’ve been through in 10 minutes before, and other times it took about an hour. I was praying with all my might that this would be one of the times that I could get through in 10 minutes or less. 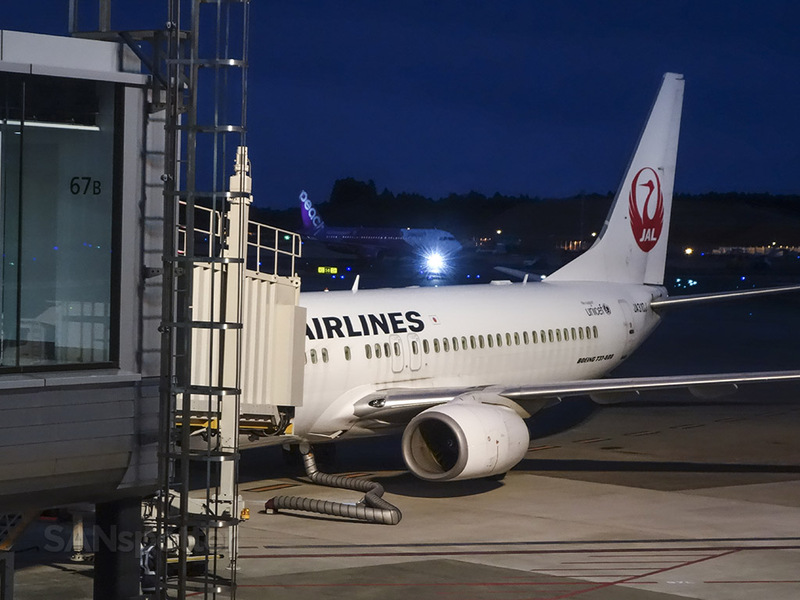 Normally I wouldn’t be so stressed about this kind of thing, but onward connections from NRT at this time of evening are not so plentiful, and chances were good that if I missed this flight I would be overnighting in Narita. I love Japan dearly, but I wasn’t in the mood for a missed connection tonight. Or a panic attack. Japan Airlines 737-800 (JA310J) side view illustration by norebbo.com. Seat map of this Japan Airlines 737-800 (courtesy of seatguru.com) showing my seat (3K) for this flight to PEK. 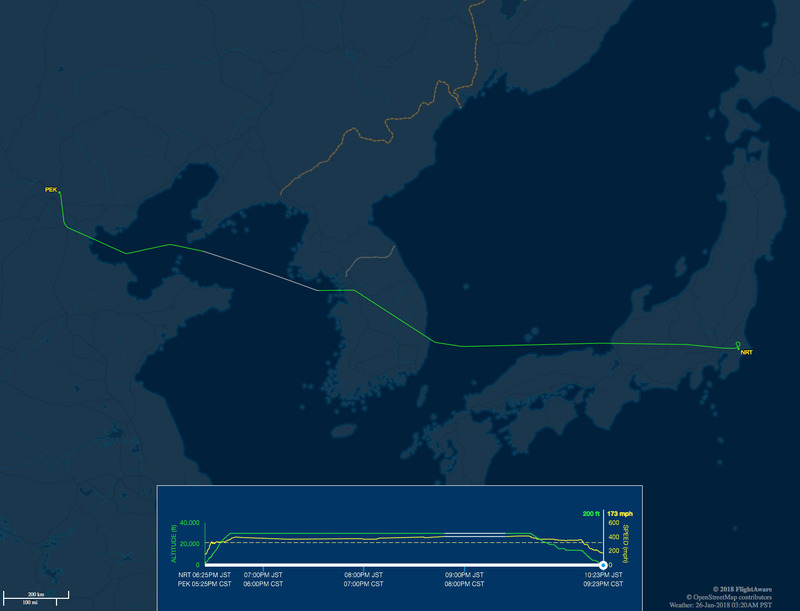 Our route from NRT to PEK this evening. Looks like we buzzed North Korea on the way over! Do you ever have moments where you feel really stupid about making a big deal about something when it was completely unnecessary? I was feeling exactly that as I was standing out in the main terminal after passing through the security check exactly 14 minutes after stepping off of the flight from SAN. I had made it, with over an hour to spare. Panic attack averted. Making the transition back to “happy and relaxed traveler” mode came naturally as I began the walk to the departure gate for this flight to Beijing, and it felt so good to purge the thought of having to stay the night here at Narita and figure out a plan for the rest of my journey the next day. As long as there were no flight cancellations or major delays, I was definitely on my way to Beijing tonight. It was one heck of a long walk to gate 67B, but here I am. It’s a good lookin’ airport terminal, isn’t it? 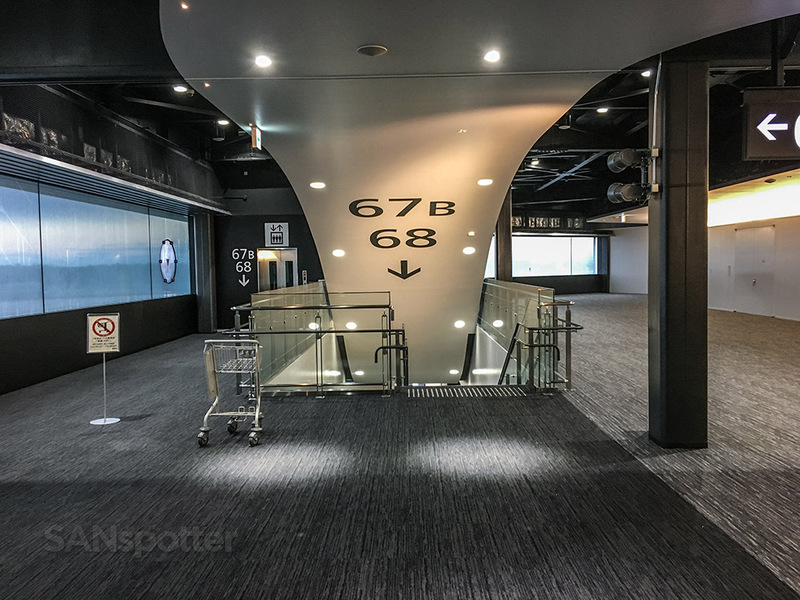 This is the first time that I’ve ever been in the JAL portion of Narita airport, and I got to say that it’s quite nice – especially in the new section which looks like it was built yesterday. Everything is drenched in glass and metal and just beautifully lit, which was a nice consolation prize for having to walk nearly a mile to reach it. Seriously, that was a long walk, and as luck would have it my flight was departing all the way at the very end from the very last gate. Well, at least I got to see every bit of this nice section of the airport. Holy moly. This is not the crusty old NRT I’m remember! 5 stars (and 10 internets) goes to the design team who whipped this up. 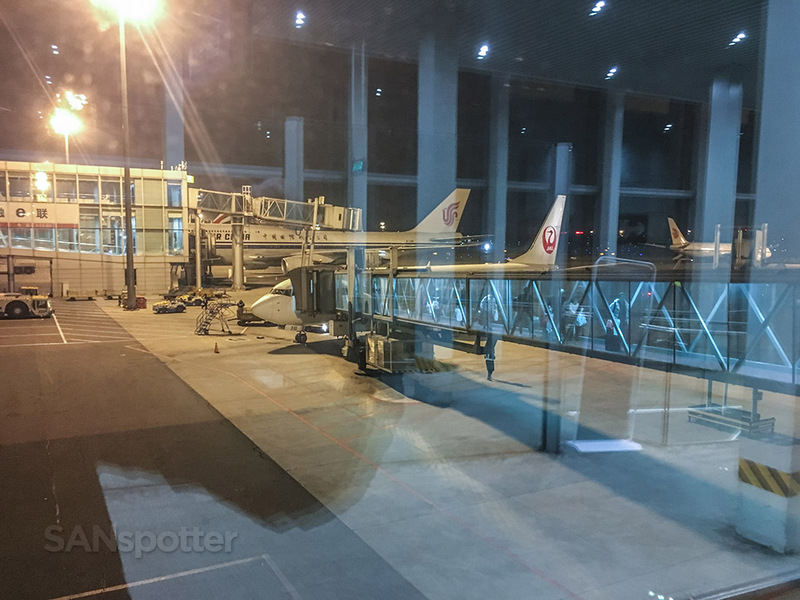 Unfortunately, this was the best view I could get of my bird to Beijing right after I arrived at the gate. That design team must have rushed through the part about avoiding condensation on the windows – either that or it was right after lunch and they were too drunk on sake to care. SANspotter doesn’t let a bit of condensation foil his photo plans though. 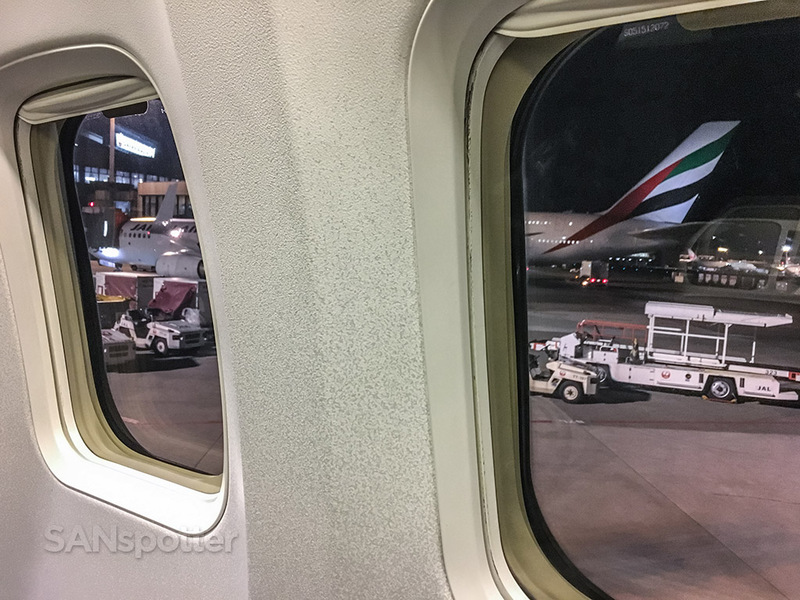 I managed to find a dry spot on the window in order to nab this shot right before boarding. As I was sitting there waiting for the flight begin boarding, I was thinking how nice it was to be back in Japan again (if only briefly). Everything is so clean, the people are so nice, and everything runs like clockwork – right down to the second. Yup…my flight to Beijing started boarding exactly as scheduled, and not a second before or after. Feeling like I’m in the minority here in the gate area with my US passport. I didn’t see any others while I was waiting to board so it was up to me to represent the United States of America on this flight. Is that a scary thought or what? My expectations were really low as I was walking down the jet bridge to this Boeing 737-800. 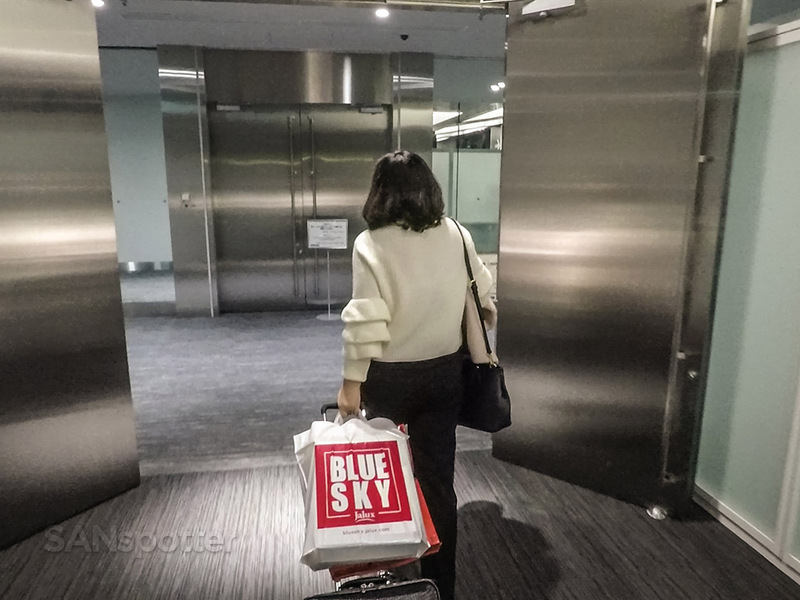 There would be no Shell Flat Neo or Sky Suite business class seats in this particular bird, but it didn’t really matter to me since this was kind of a short flight anyway and I just wanted to get to Beijing. Economy class would’ve been perfectly OK to be quite honest. Follow the lady in the white sweater! She had a vigor in her step which gave me confidence that she knew exactly where she was going. 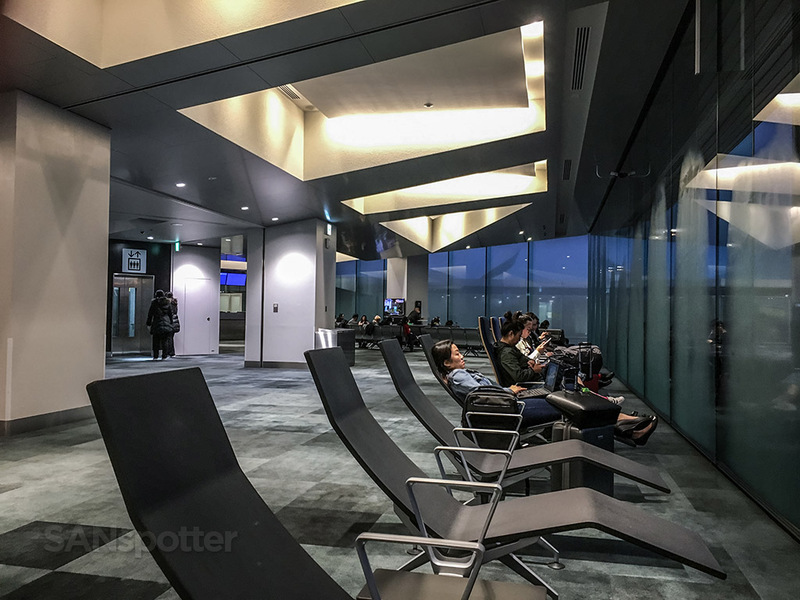 This is a seriously cool airport terminal. It’s kind of a bummer that I didn’t have more time to have a better look around. My guide to the plane was walking too fast to keep up with. I told you she had vigor! The good news was that we were really close now and I was sure that I could find my way without assistance from here on out. 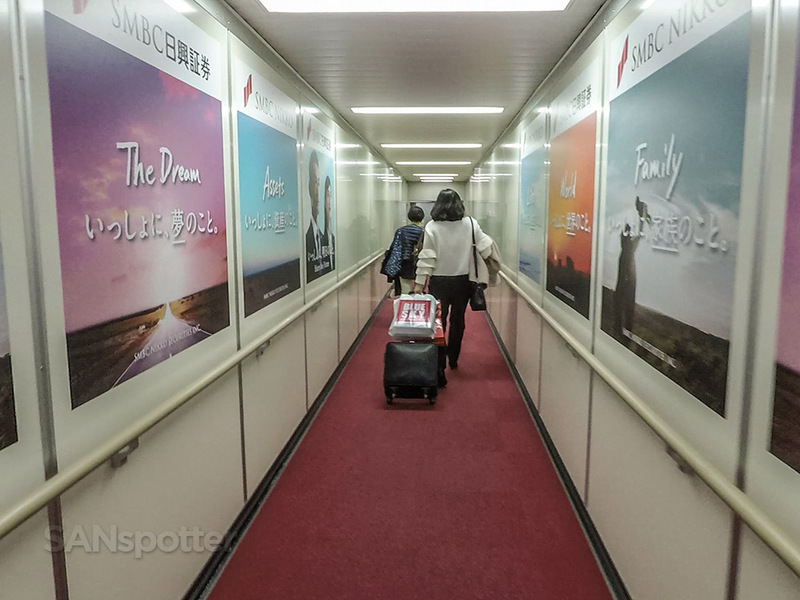 It had only been an hour and 15 minutes, but OMG it felt good to get back on another JAL airplane. 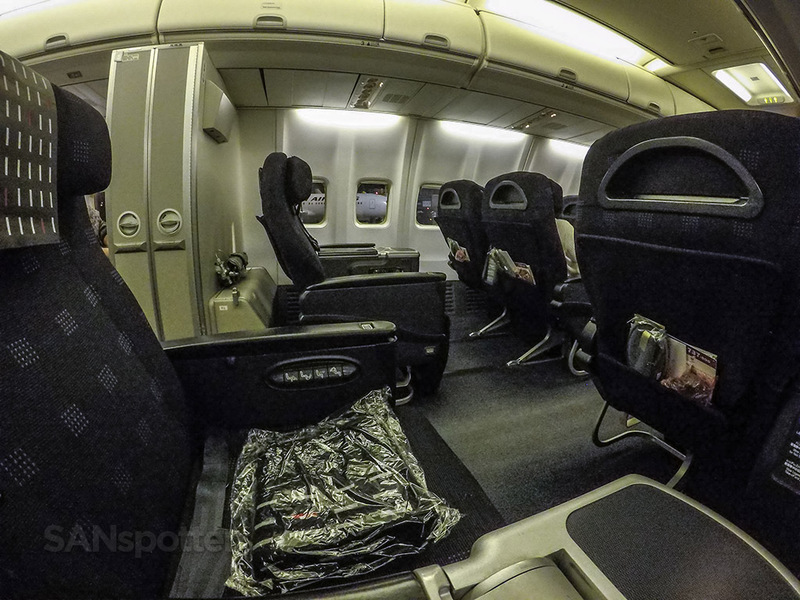 Japan Airlines 737-800 business class cabin. A bit dark, but at least there was a cheery flight attendant standing there brightening the mood. 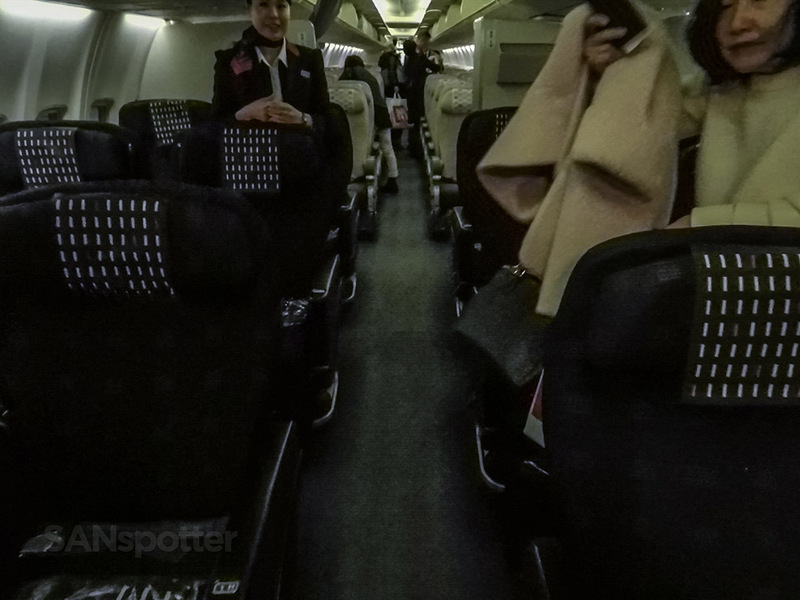 Japan Airlines 737-800 business class seat. And a pair of bright red shoes adding a splash of color to an overall drab business class product. 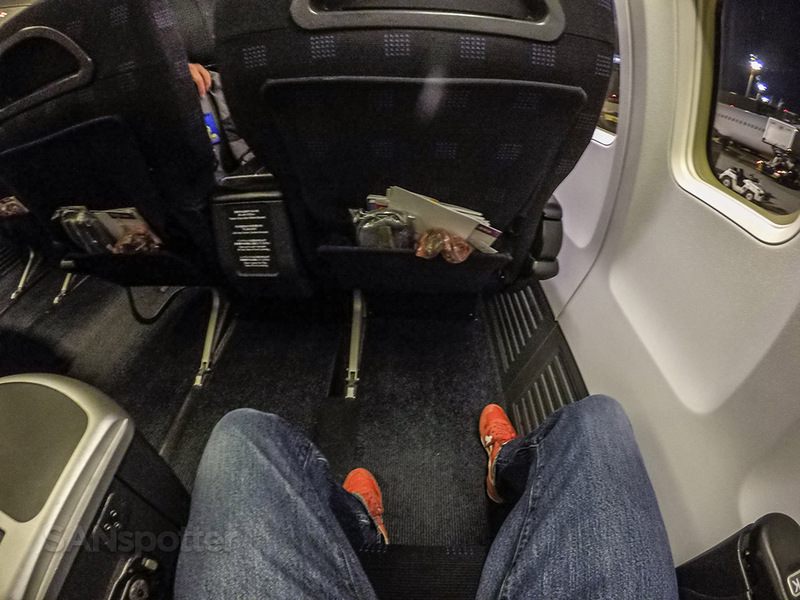 There’s really nothing special about these seats, but the leg room is quite generous. How about those shoes though? See what happens when the red shoes are taken out of the equation? It’s looking rather dull in here! All jokes aside, I think it’s important to note that this was exactly what I was expecting, so I wasn’t dissapointed at all. Here’s a non-wide angle pic of the same view, which shows that it’s actually a decent looking interior. I was the second business class passenger to arrive, and within moments of sitting down, a flight attendant came by with a basket full of earplugs, toothbrushes, and eye masks. I politely declined and just sat there settling in and getting all my belongings put away so as not to annoy the person who would be occupying the seat next to me. Another gentle reminder that I need to give Emirates a try ASAP. That pesky little airline from the Middle East is pretty much at the top of my wish list at the moment. 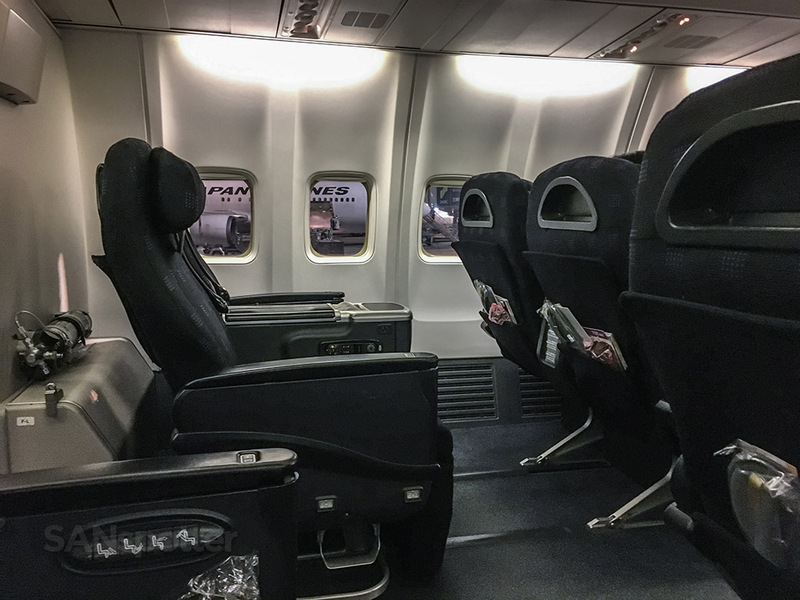 Much to my surprise and happiness, this was yet another business class cabin that ended up being less than half full once the boarding door was closed. 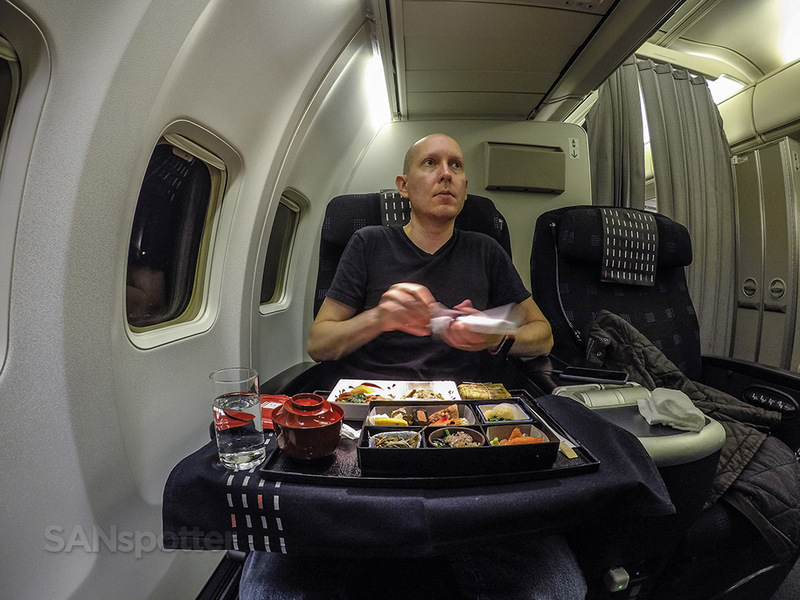 There were 12 business class seats on this particular aircraft, and only five were occupied as best I could tell. Passenger number 5 coming onboard just as the door was closing. Another light load in business class! What the heck is going on today? My flight over from San Diego was really empty, and this one was probably even more so. It’s actually a bit worrying when that kind of thing happens, because I then start thinking about some major news (like a virus) or something that’s going on at the moment that I have absolutely no idea about. I honestly have no idea how I’m eventually going to die, but part of me really believes that it’s going to happen out of my own ignorance of current events. If all the news stations suddenly said “don’t go outside because there’s a lethal killer virus that will kill you dead”, I’d likely miss it and be one of the first casualties. That’s how I roll. 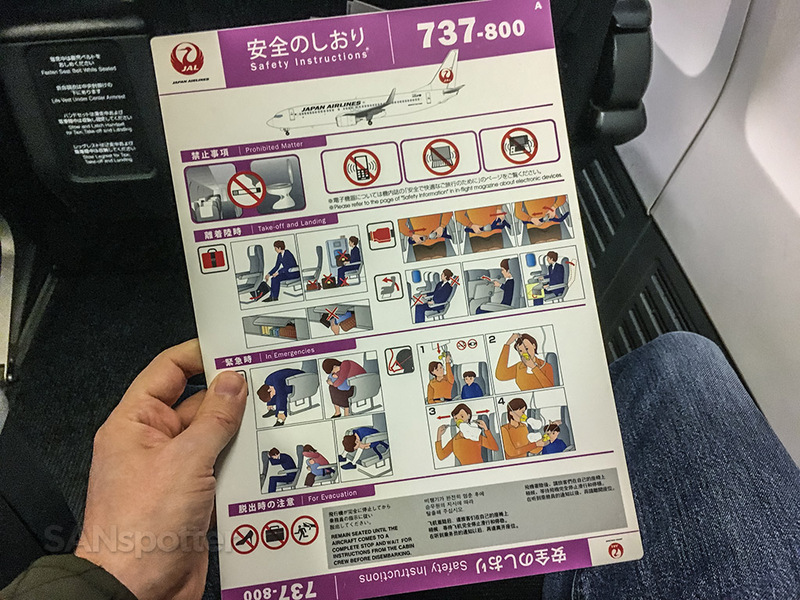 Do I carefully note where the emergency exits are, or use this opportunity to feel bad about my many failed attempts to learn Japanese? Oh and let’s not forget about being reminded about the fact that we’ll be flying over water again. Icy cold water, so cold that it’ll kill you in less than a minute. 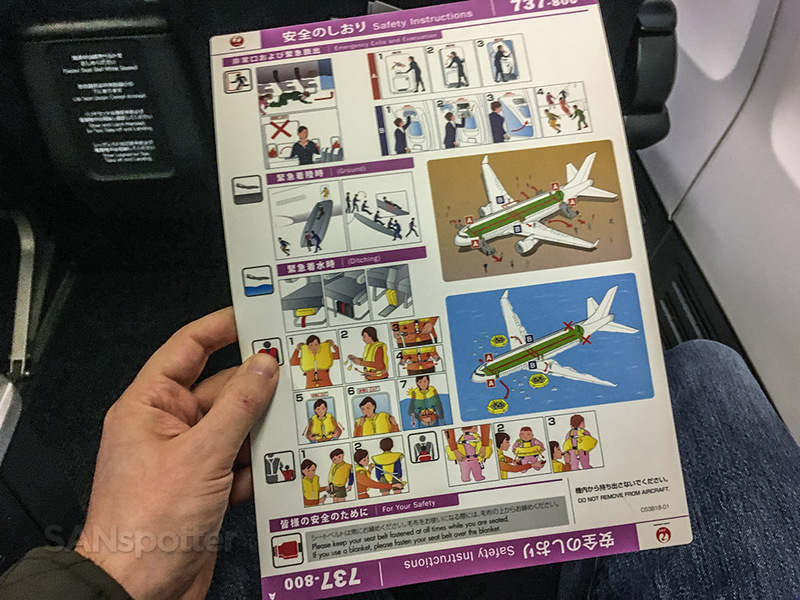 Why don’t they put that kind of stuff on the safety card? 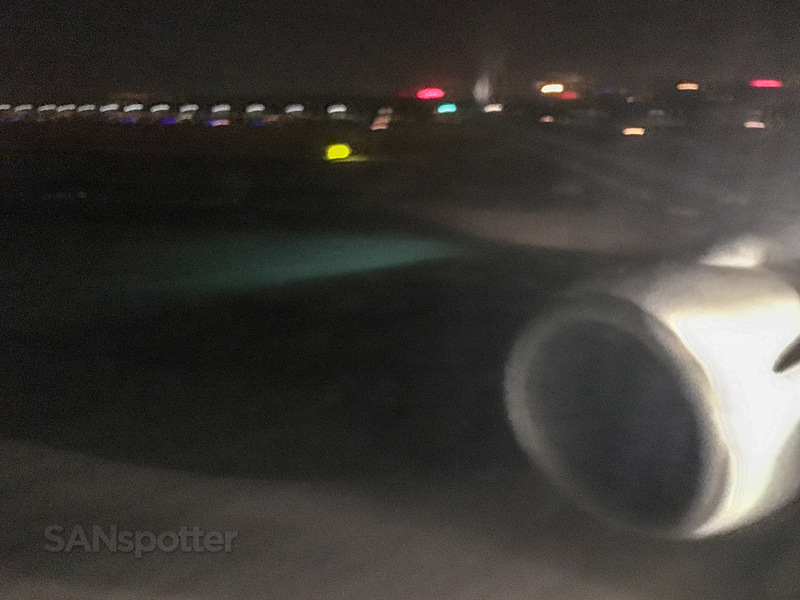 Our pushback from the gate was just as timely as the boarding process, and after a short taxi out in the dark outer regions of NRT, the pilots found our departure runway and we were off. Enjoying my solitude way back here in seat 3K. By the way, this represents the only departure pic of this trip report, as there was nothing to see other than complete blackness. If you’re the type who digs that sort of thing, lemme know and I can send you the pics. The flight attendants came by with hot towels roughly 10 minutes after departure, and I asked about entry forms for China. Little did I know that they were thinking ahead, and there were forms in the seat back pockets waiting for all passengers. Nice! Next up was the meal service. 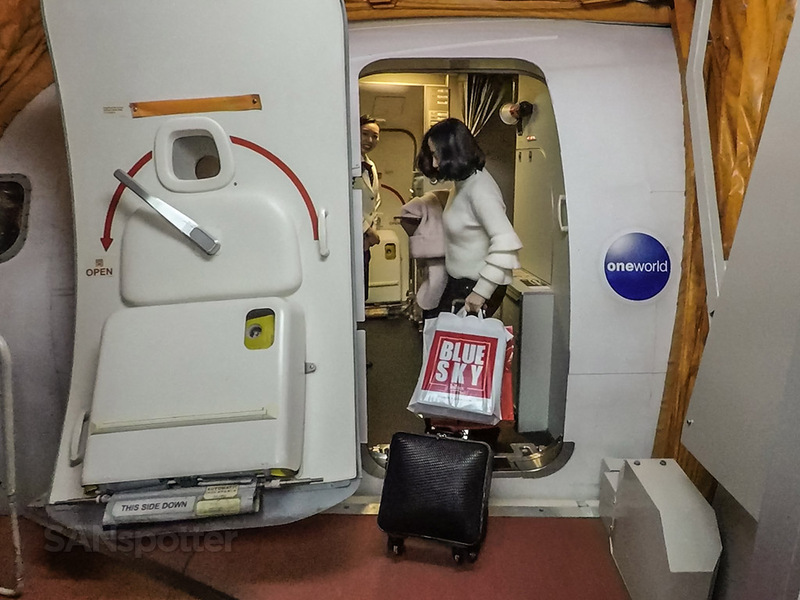 There were no menus distributed on this flight, but the lead flight attendant (Ayumi) came by and offered two choices: the Western option, or the Japanese. I totally forgot what the western option was, most likely because I wasn’t even going to consider it since I was on a Japanese airline and Japanese food on Japanese airlines is the only way to go. Period. I also had no idea what the Japanese meal consisted of, but I knew it would be amazing – only because I love Japanese food so much. As long as there’s no natto (blech! ), I’ll be very happy to eat it all – whatever it is. Service began with a beverage and a snack. I had water of course, but thinking back on it, this was an unfortunate missed opportunity for a shot of sake. Just…wow! 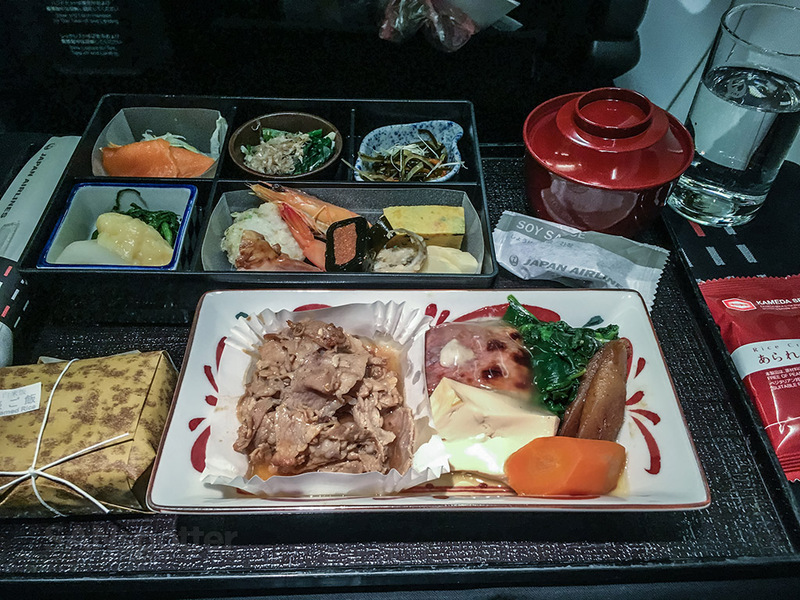 That’s one heck of a meal considering that this is just a short regional flight! Itadakimasu! This is a joke, right? Am I being punked? I was just waiting for them to come out snickering, telling me that no, meals like this aren’t normal, and then swapping it with a cold and stale ham sandwich (while laughing hysterically all the way back to the galley). Long story short, I ate it all despite not being all that hungry. It was really good, and no, I had absolutely no idea what some of that stuff was. Most Japanese food is really healthy though, and I do like eating clean, so it got two very big thumbs up from SANspotter. A small cup of rock-hard ice cream. How in the world do they manage to get this stuff SO cold that it takes 10 minutes before a spoon can penetrate the outer first millimeter? Airplane freezers are serious machines. Every now and then I get a little bit self-conscious about all of the pictures I take during a flight, especially during the meal service. 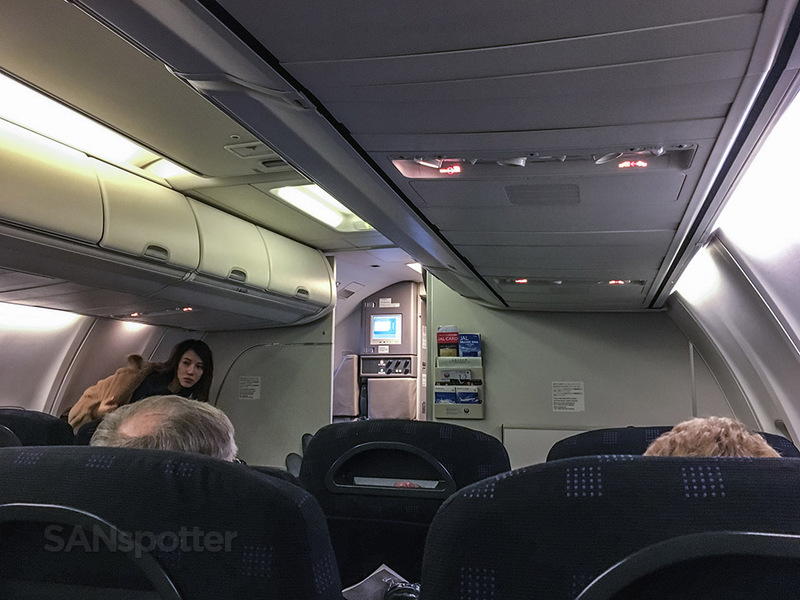 Since this was a very light load up here in business class today, the flight attendants didn’t really have much to do and they spent much of the flight just kind of hovering around waiting to serve us. I could sense them watching me as I took pictures of my food, and it did make me feel little bit awkward, but I don’t mind so much since it’s such an important part of my trip reports. Just as I was finishing up my ice cream, Ayumi stopped by and mentioned that she noticed that I was taking a lot of pictures, and thought that I might enjoy a gift that she had for me. 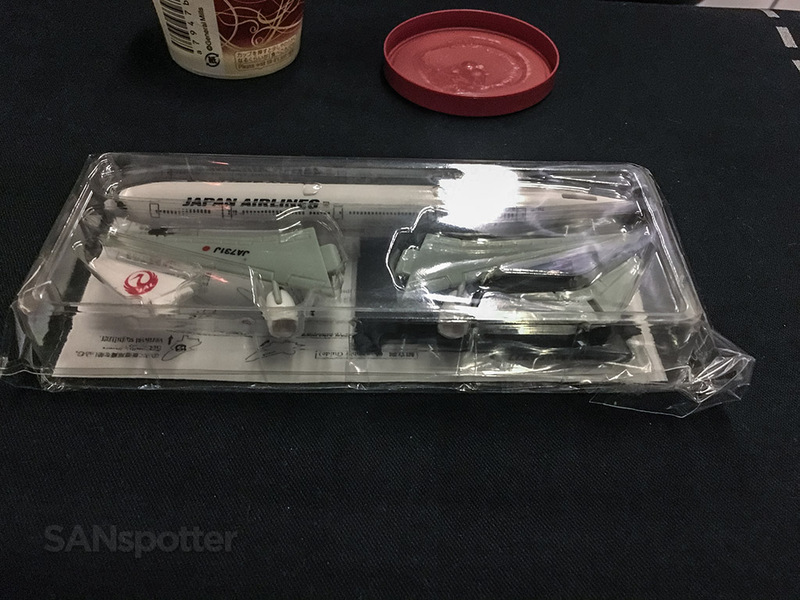 It was a plastic model of a JAL 777, and I was pretty much speechless as she presented it to me. Is that really generous or what? It was completely unexpected, and it really blew me away that she could be so kind. I guess it was pretty obvious that I was enjoying the flight immensely, and that kind of proactive gesture made it even better. That was definitely the highlight of the trip so far. 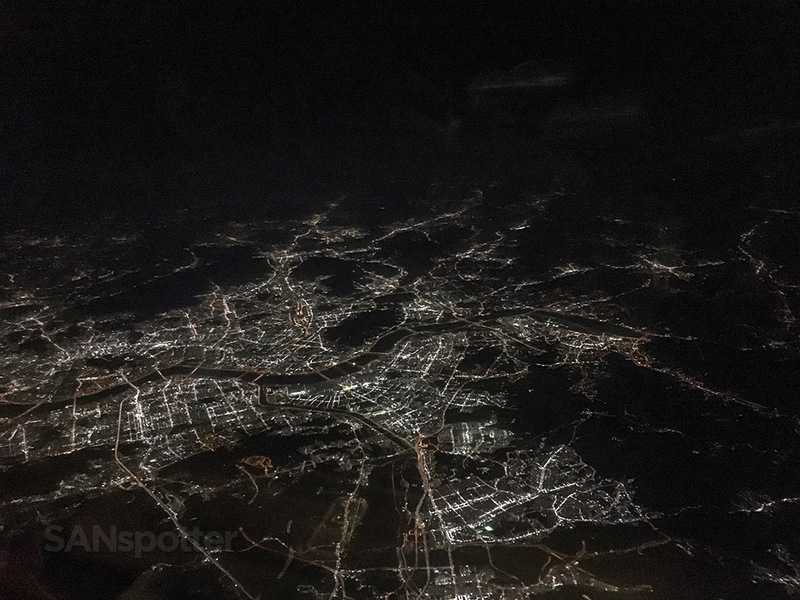 There’s really not a whole lot to say about the rest of this flight, as the jetlag was really starting to catch up with me and I couldn’t help but to start feeling incredibly sleepy as we passed right overtop of Seoul. Seoul, Korea. Good to see you again! I slept on and off for the rest of the flight, waking up every now and then to tilt my head the other way to reduce the painful strain on my neck. 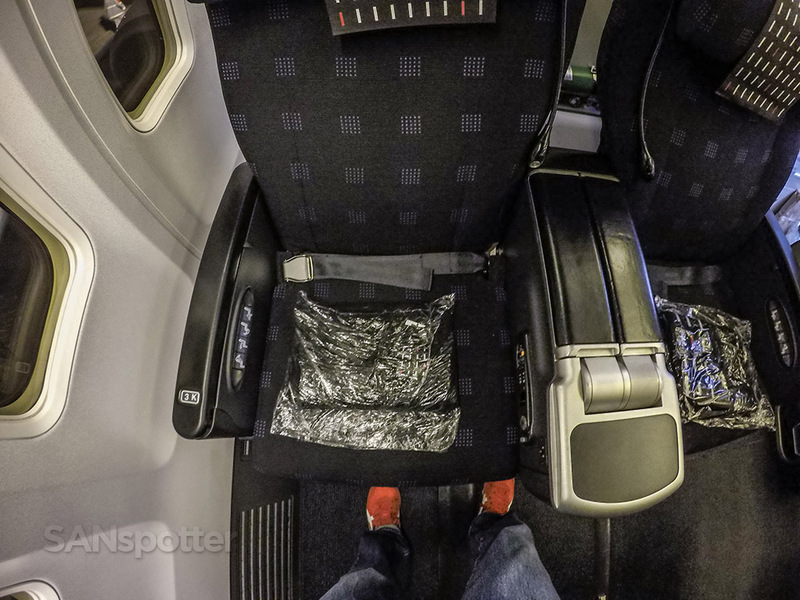 These seats were not very comfortable, and it felt just like I was sleeping way back in the bowels of economy class. 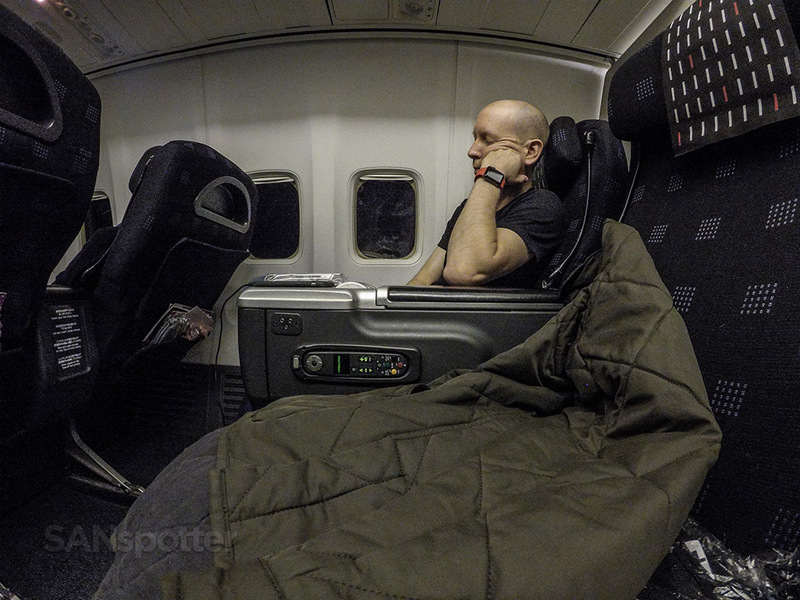 And we all know that economy class sleep is never good. Especially in the bowels. 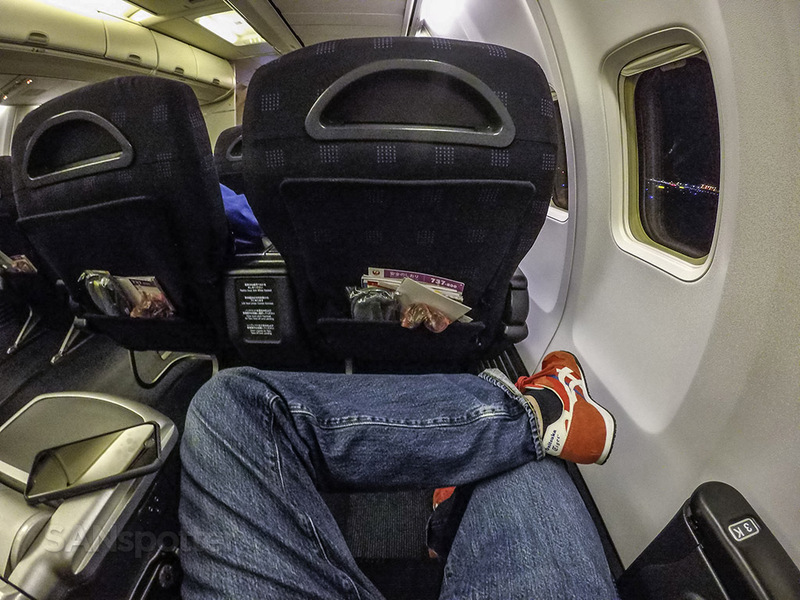 Airplane sleep – in seats that don’t recline more than a few inches. Ouch. The good news is that we arrived at Beijing right on time. The bad news was that it was completely dark outside and I couldn’t see a darn thing. Oh well. 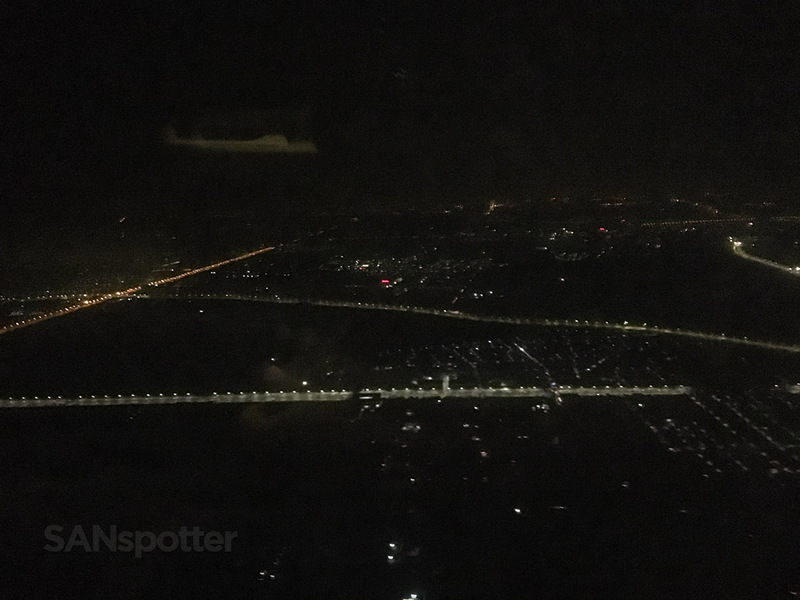 This wasn’t the first time I had ever flown into PEK, so I already knew that it was a huge airport that seems to go on for miles and miles. The taxi into the gate would likely take a while. I see lights out there. That’s a good sign. No water landings yet on this trip! See, this is exactly why I didn’t post any pics of the departure sequence. Grainy and blurry pics that are indistinguishable from arriving at Beijing or Flint, MI don’t really add much to the story! 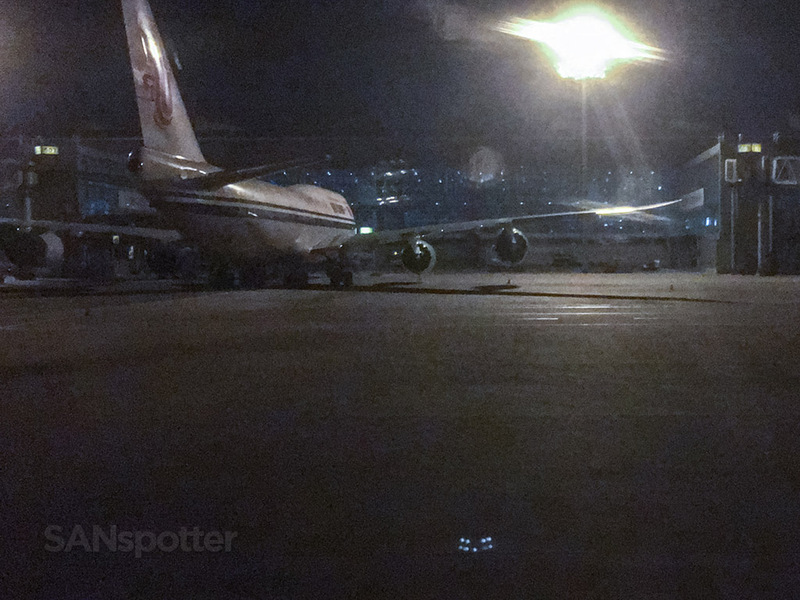 Since when did Air China receive 747-8i’s? 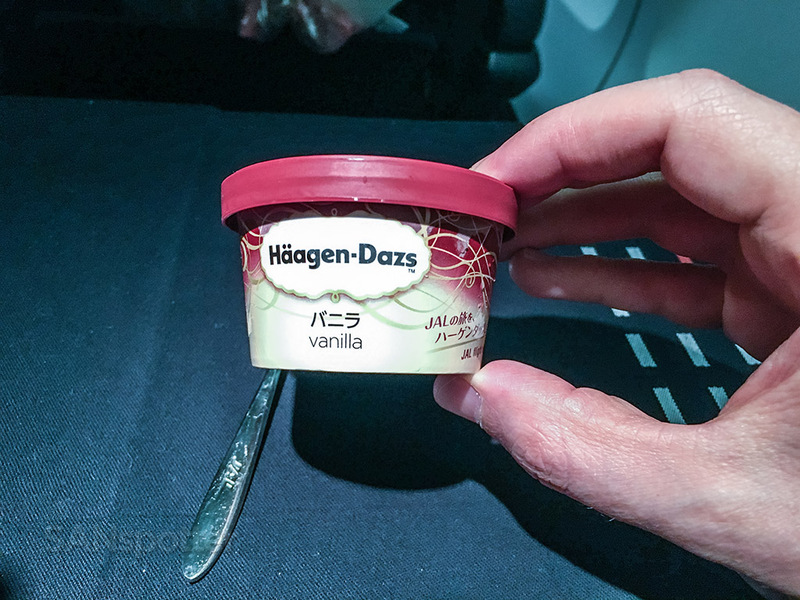 I totally didn’t know they had any, and I began fearing that there would be a grumpy old Chinese guy standing at the entrance to the terminal demanding me to surrender my AvGeek credentials right there on the spot. Yes, the taxi to the gate took a while. 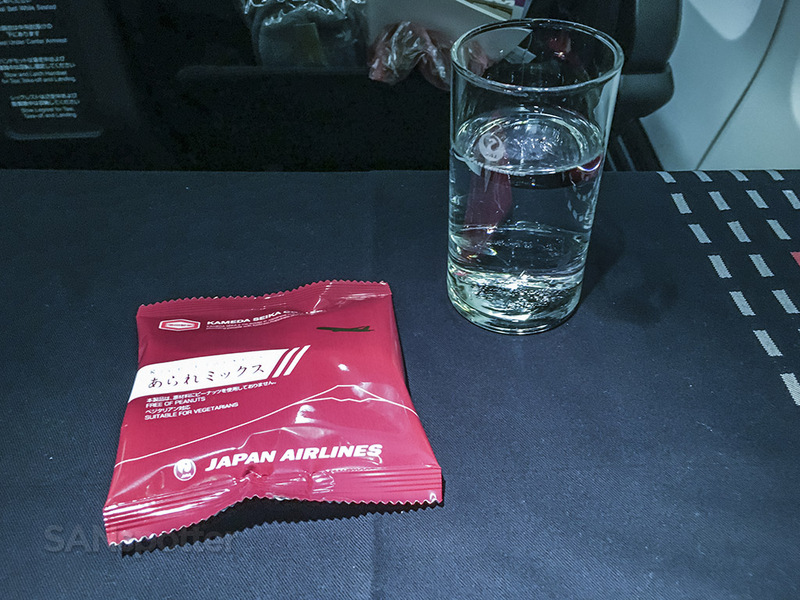 But that’s OK, because my first ever flights on JAL were now complete, and I was feeling really good about the experience. A long taxi time into the gate wasn’t going to sour my spirits any, but I think I may have been a bit too happy and satisfied because I inadvertently forgot to unplug my iPhone charger from the electrical outlet between the seats and I left it on the plane behind me. Damn. Docked at the gate, and collecting all my belongings. Except for my iPhone charger, which was still plugged into the electrical outlet between the seats. Damn! Oh well – I hope whoever found it is giving it a happy home, full of thirsty iPhones to charge. There’s no scarier feeling in the world then arriving at a new destination with a phone that has less than 30% battery left and absolutely no way to charge it. 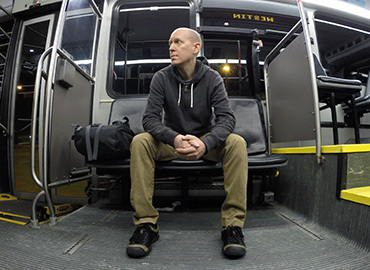 At least I didn’t realize that I had lost the charger until I was in my hotel room later that night, so I was able to happily walk out of the airport and into a taxi with a huge smile on my face for arriving in Beijing comfortably and perfectly on time. Ignorance is bliss, right? Sayonara iPhone charger. Hope you have a good life here in China. *sniff* On second thought, it was probably made here, so perhaps this story has a happy ending. Welcome home good buddy! 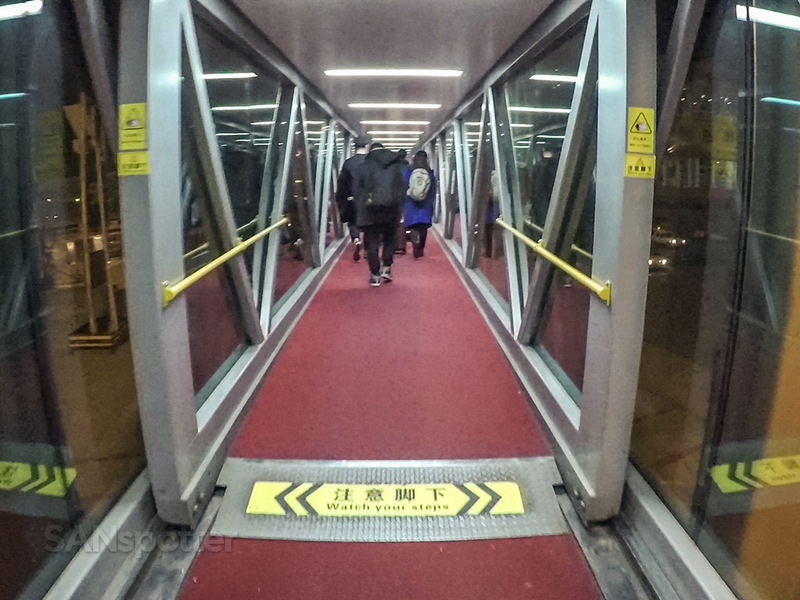 Inside the monstrosity that is PEK. 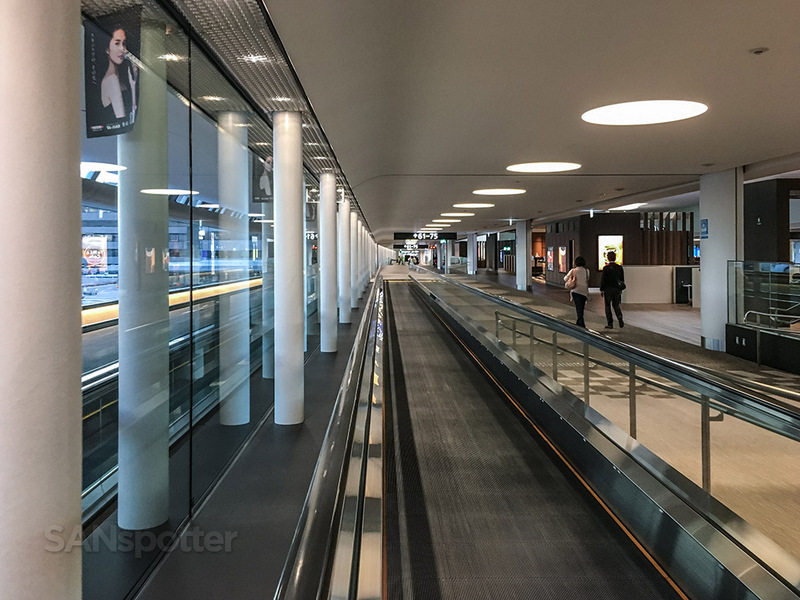 I’ve got to say that this airport is simply amazing – the sheer size of it is incomprehensible, and the fact that they managed to make it look so good is just the icing on the cake. Welcome to Beijing. 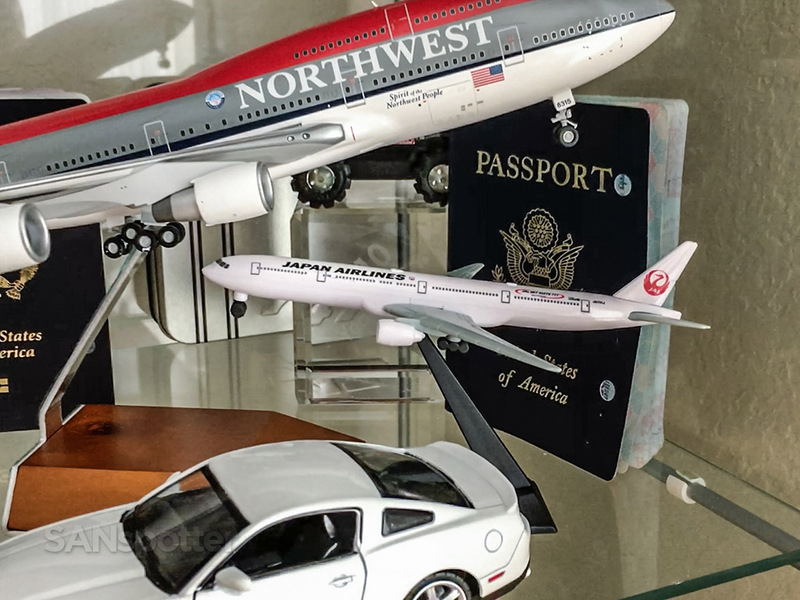 By the way, here’s the scale model of that JAL 777-300 sitting proudly in my display case at home. 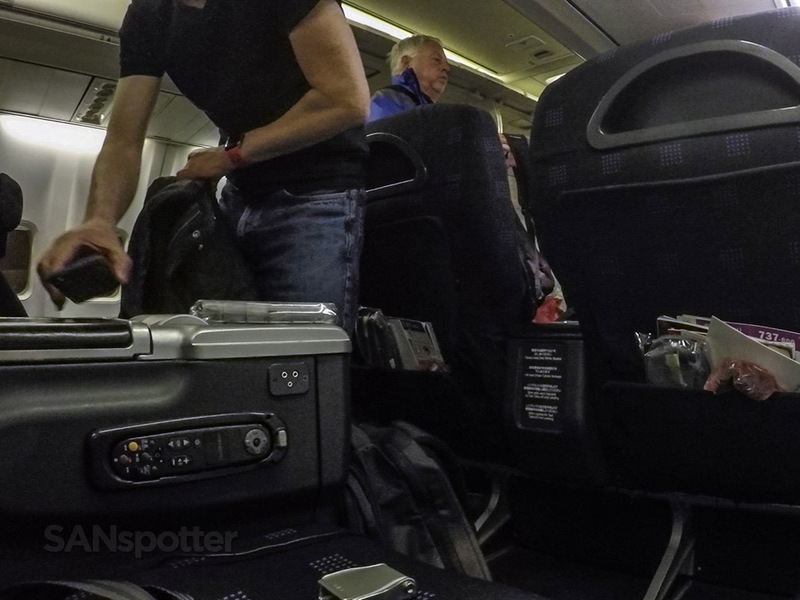 Thanks again Ayumi – your ability to correctly identify nerdy AvGeeks is second to none! I loved it. 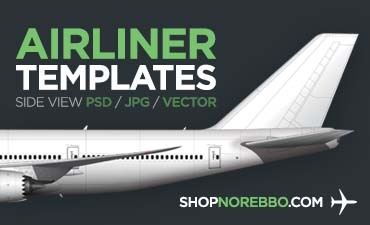 Two questions: One, how many models of planes do you have, and two, and most importantly, did you charge your phone on the trip and/or get a new charger? Great post, and I’m looking forward to the next one! Thanks Josh! Yeah, I’ve got a small collection of diecast aircraft: two 1:200 747’s (NW and UA), and a handful of others in 1:400 (Republic 727, DL L1011, NW DC-10). I’d love to have more, but I’ve got no room unfortunately. And yes, I successfully managed to find an iPhone charger during the trip! Haha! More details about that adventure will be included in my upcoming post about my time in Beijing.